For the first time I am at a loss for a catchy title.....lol! Not much happened Tuesday.....it was cold, windy, and rained most of the day and into the night. We spent our day, shut in, girding up mentally and physically for week 2 of 10 hour work days. We, of course, spent time watching news about Hurricane Sandy. So glad we are not near the northeastern coast.....what a mess! We feel so badly for all those impacted by this storm. West Virginia, where we had planned on being last weekend, got hammered with a lot of snow, but no flooding as far as I can tell. Our friend's wife broke her shoulder trail running so we cancelled our trip.....we had planned on being with them the entire weekend into Monday, but the weather alone would have been a problem, so our decision not to go because of our friend's injury also helped us avoid the snow, which could have potentially been a problem. Again the electric heaters were on all day long. It just was not a day for being outside. Amazon is expecting the work to pick up here in Campbellsville for a few days due to closure of one, or two other Amazon fulfillment centers due to Hurricane Sandy, but that remains to be seen. Since millions of people in the northeast are without power I don't think there will be much internet buying from that area going on for a week, or so. TLE fixed Jumbalia (sp?) for dinner and, of course, it was great! I took about an hour nap before dinner, and we headed over early to Amazon to see how cold, or warm it was going to be. I entered with a long sleeve t-shirt on, but after walking over to building B where it seemed even warmer than usual, changed to my short sleeve shirt. Of course, I was wearing shorts. The work "day" seemed to go fast to me until the last two hours when I, unexpectedly, developed a blister on my right big toe. I was totally surprised as I have had no issues with my New Balance shoes since I got them in Oregon in July. I did wear a different pair of socks than I normally do, but that doesn't totally explain the blister. As it turns out work did not pick up here in Campbellsville.....in fact it slowed down a little last night, and some workers (stowers) were sent home early. That makes more sense to me for the reason I previously articulated above. We, however, worked a full shift. We'll see what happens Wednesday night. We also found out that our five 10 hour work weeks will not begin until sometime after November 17th. We were scheduled to go to five 10 hour days on the 10th originally. We will, however, see a change in the days we work....Wednesday through Saturday beginning November 17th in preparation for the week we will add the 5th day, which will be Tuesdays, making our work week Tuesday through Saturday (technically Sunday morning) then. That means the week of the 17th we will have a 4 day weekend......Saturday through Tuesday. As I sit here writing the sun has come out, and there is not a cloud to be seen in the sky. I got up at 8:30am after only 4 hours of sleep longer.....I just couldn't sleep any longer for some reason, so there is a long nap in my future today.....maybe sooner than later. TLE is still sound asleep! We have been at Heartland RV Park in Campbellsville for almost a month (a month tomorrow) and we have had our window awnings out the entire time. One time during the past four weeks we took down the patio awning overnight due to wind. Monday the wind came with a determined, continuous velocity that finally forced us to put everything "down" except the EZUP which seemed to be in no distress. At this point I am assuming that our wind is a spin off from Sandy, which is pounding the northeast coast right now. What I do know is that Monday was very cold all day long. The heaters, again, were on all day. The downside to the continuous dry heat is I get a headache. Monday marks the end of our three day weekend, and on Tuesday we go back to our four 10 hour days. Now that we have been through a week of the 10 hour days, and the 3 day recuperation period we are much more confident in handling the remaining 7 weeks of our commitment. No doubt you are wondering why we are doing this gig if it so hard. In writing about our experiences here at Amazon I am attempting to give you a blow by blow "words eye view" of our experience with all the pimples and warts exposed.....no air brushing here! I do not want to present a sugar coated view of working at Amazon, but on the other hand I want to tell all that we have not been surprised by the physical requirements of this job. The Amazon recruiter did a good job at conveying the difficulty of the job we would be doing. Knowing the physical demands of the job in advance helped us make our decision without blinders on. Like any new job there is an adjustment period. The recruiter is quick to tell you, and repeats often, that it takes about 4 weeks to settle into this job, and to adjust to the physical requirements, and they are right on the money. We have no regrets. Ultimately we are here to stockpile diesel fuel money which should cover our travels for the next 24 months, and take pressure off our routine monthly income. Not only are we earning money while we sit for two and a half months, but we are not buying diesel fuel during that time. We have close to a full tank of fuel and won't have to fill up again until sometime in mid January somewhere in Florida. Around Noon I accompanied TLE to Krogers to shop for groceries. You know, it's funny, even 10 months ago going shopping for groceries did not appear on my list of 100 things I'd enjoy doing on a Monday. Now, 9 months into our nomadic journey I do enjoy grocery shopping, especially now since I actually know how to find things in the grocery store. Before it was an unsolvable puzzle for me. Of course, 10 months ago having me along for grocery shopping would not have appeared on TLE's list of 1000 things she would want to do on a Monday....:D......now she says say enjoys having me along. Other than taking down the awnings I did nothing very productive other than soak my feet in Epsom Salts......it really does make a difference....seriously! I used to soak my feet most days when I returned from doing soccer matches. It really takes the ache and stiffness out of my feet. Frankly doing three 90 minute soccer matches over a period of 6-7 hours, running most of the time, was easier than standing/walking on concrete for 10 hours. It is not for the faint of heart. The Lovely Elaine prepared the ingredients for beef barley soup and put them in the crock pot in the morning. What a nice way to end a cold, blustery, late Fall day. We woke up around 9:30am, but it felt and looked like midnight. There was no rain Saturday night, but the cloud cover at 9:30 in the morning was so heavy and thick it felt like midnight. It was DARK and COLD......around 34 degrees, and the heaters were going full blast. Of course, this was another veg day for us, however, we were going to venture out to have brunch at C.U. (Campbellsville University) again with our Camper Force friends. I've told TLE a few times that one of the unexpected benefits of this short term job is the new friends we are making. These people we work with are quality people, and to do this job we all have to be. This job, while seeming to be menial takes concentration, endurance and integrity. We are told that the Camper Force workers are always, as a group, more dependable and consistent than their full time work force. We headed over to C.U. around 11:20am to meet up with our friends for an hour and a half of good food, and conversation. I noticed, while waiting my turn to cook a Belgian Waffle, a sign by the toasters that says "PLEASE DO NOT PUT BUTTERED BREAD IN THE TOASTER".....hmmmm....I thought that was obvious, but, apparently, if they have taken the time to print up a 3 color sign, and frame it, we must be talking about a serious, ongoing problem. To me it's kind of like do you have to be told not to use a rotary lawnmower to trim the hedges? After we bid adieu to our friends we decided to head over to the Peddler's Mall for see if anything new had come in.....besides we did need to do a little walking before we vegged out the remainder of the day! We have been looking for a salt and pepper caddie for our dining table, and, of course, TLE is always looking for a couple more paperbacks....:D We found a salt and pepper caddie, and TLE did find a couple more books. We spent the remainder of the day.....okay, "I" spent the rest of the day watching football, and catching cat naps.....TLE spent her "veg" time reading. I kept turning up the heaters because the cold outside was that penetrating kind of cold. I even had to turn on one of the gas heaters to supplement the electric heaters, and Monday is supposed to be colder. 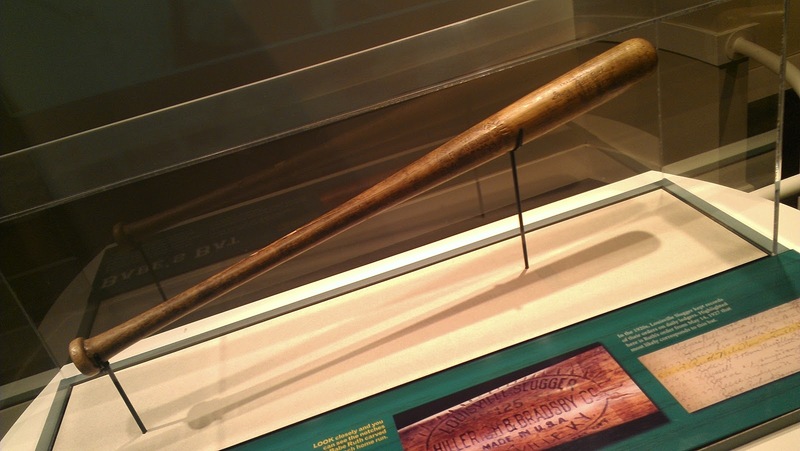 By the way, there were two very interesting games, for me, in the afternoon and evening.....the Giants v. Cowboys came down to the last play of the game, and Denver beat the Saints like a drum in the nightcap. The Manning boys are making Archie proud. That was Sunday, and now we only have 7 weeks remaining before we head to Florida. It rained most of the morning.....I was going to say "night" because it still feels like night even though we went to bed between 5:30 and 6am Saturday morning. Nevertheless, it rained on and off until we got up around 1pm.....that is the latest I have slept in since college. Of course, 1pm is when most of the college games start, so I sat watching NCAA football sipping my first and second cups of coffee, and, frankly, that it pretty much how the entire day went. I think I went outside one time to empty the trash, but otherwise stayed inside where it was warm. We had both electric heaters going all day long to fend off the cold. Of course there were two, or three delicious naps during the day. We decided we want to maintain our sleeping schedule somewhat. We're not going to stay up til 4am, but 1am is good enough. Still need to work on sleeping in. In between I gave TLE long back rub, and later she gave me a pedicure.....time to whittle those heal calluses down to size! Around 5pm.....wow, dinner comes fast when you sleep til 1pm! TLE didn't feel like cooking, and I don't blame her, so she drove into town to Magic Wok for some Sweet and Sour Chicken and rice for dinner. Came to $8 for a filling dinner. After dinner I continued watching football.......of course my Trojans lost to Arizona.....wth! And then Oklahoma lost to Notre Dame.....I guess they, the Fighting Irish, are for real. That defense is unreal. Alabama destroyed Mississippi, and showed they are definitely deserving of their number 1 status. We pretty much acted like zombies all day.....the only difference between our Zombieland and the the movie is no one died in ours.....we just vegged out all day long, and we don't feel a bit guilty.....no, not one bit. We retired for the day at 1:30am......actually, I guess you would say we retired the next morning at 1:30am. We have become creatures of the night. Friday was the complete antithesis of Thursday. Thursday was very warm....in the low 80's, and Friday was in the low 50's, very overcast with the promise of rain in the air. I managed to sleep in til 11:30am....a new record for me. I did much better Thursday night. I drank more water, laid off the Dr. Pepper, and fared much, much better. Although my feet were barking at me the last hour. I do much better when I'm moving around continuously, but when I stand in one area for a long time they start hurting. Every once in a while the computer has you standing in one area for a long time picking many things in a small geographical area. We mostly just took at easy Friday afternoon taking naps......in fact I laid down around 3pm and slept until after 4:10pm, and I'm glad I did. Just before 5 it started raining. We had planned to drive the car over to Amazon because the forecast was for 60% chance of rain by 4am, our quitting time. We hit the decks running at 5:30, and the 10 hour shift went pretty fast. I think I picked close to 1,000 items last night, and that was after a rough start. My first pick area was in the "M mod" and I think the first 12 things I was directed to pick by the computer were not in their assigned place. I think prior to Friday night I had recorded less than 10 things missing, and here I was with 12 already in one night. I called the "Pick" desk and they told me to logout and then log back in....fortunately it sent me to "P mod", and the night went better. Overall we both did much better physically and mentally last night. It feels like we are adjusting to the hours, and physical demand of standing/walking on concrete for 10 hours four days a week. On top of that I've lost about 5 pounds this week from all the walking. Wednesday night at Amazon really kicked my butttttt! As I was finishing my second 10 hour shift I was thinking to myself "How can I do this for 7 more weeks? "....well, that's the printable version of my dark mental processes around 3:30am Thursday morning. Physically I was doing OK, but mentally I was a basket case. But, before we go any further with that let's get back to the most important thing for Thursday....picking up the T-Bird from Bob Swope Ford in Elizabethtown. I awoke around 10:30am thinking I needed to be on the road by 11:30 to Elizabethtown in order to get back around 1:30pm, and rest up before the dreaded third 10 hour shift at Amazon. 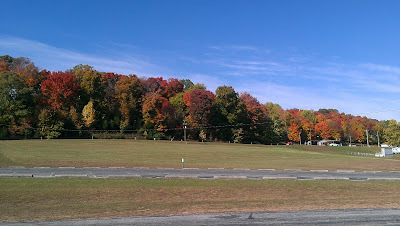 The drive in was pleasant enough as I listened to a CD I brought along of "One Hit Wonders" I made years ago. I think I was on song 24 of 28 when I pulled into Enteprise around 12:15pm. One pleasant surprise was Enterprise only charged us for one day, even though we had the car for 2 full days......cool. Then I went over to Bob Swope Ford to pick up our baby. I have to tell you....even though Josh, the mechanic, was 99.9% positive replacing the alternator would fix the problem, I was skeptical. Not because I didn't trust him, or, frankly, myself, because that was my diagnosis from the beginning. I was skeptical because these newer cars are so complicated, and soooo electronic now that it was not difficult for me to believe that there was some gremlin in the electrical system. Nevertheless, I paid my $603 bill, got in the 'Bird and began the drive home. As I left the town of Elizabethtown in my rear view mirror I continually checked for warning lights on the dash.....there were none. As I hit the half way mark on the drive home I began to get more comfortable, and when I pulled into Heartland RV Park I had a big smile on my face, and relief in my heart. I arrived home around 1:40pm (TLE stayed home). Now I'm beginning to wonder if some of the other electrical issues we have had the last 8 months, while minor, were not the symptoms of a failing alternator. We have only driven the 'Bird around 2,000 mile since we left Riverside, CA, so it is possible that the other issues were related.....we will see. Anyway, after getting home I immediately took a nap, had some lunch, then took another nap, then had dinner around 4pm. In between I was thinking about what I could change to make my 3rd 10 hour shift go better. I decided to drink a lot more water. Amazon provides FREE bottled water at several refrigerated dispensers scattered throughout the facility. On all of our previous 5 and 10 hour shifts I had consumed between 1, and 2 bottles. I decided to cut out any soft drinks, and drink at least 1 bottle of water every 2.5 hours. Now that I have successfully completed my 3rd 10 hour shift I can tell you that drinking more water made a significant difference. Was I still very tired at the end of my shift.....yes, but was I more mentally alert and competent.....you bet! I think was getting a little dehydrated the first two nights. The other thing I added was drinking a small cup of coffee at each break.....oh, by the way, coffee is also free at Amazon, and it is not bad. Well, that's another day in the Amazon.com world. Things are looking up,and confidence is high.....well, higher than it was before. Friday is our first payday, and I am looking forward to a three day weekend. Our second 10 hour work night was a little more difficult than the first......I really had a power fade the last 5 hours. I think my body is still adjusting to being up all night, but I get ahead of myself again! I woke up around 9:30am after our first all night work session.....got to bed around 4:30am. Just couldn't sleep anymore. Around Noon I called Bob Swope Ford to find out about the T-Bird status. After doing all the testing on the electrical system, including the charge system, plus taking it for another test drive and having it quit on the mechanic, just like it did for me, pointed the finger back where I thought it would end up....the alternator. So, a replacement has been ordered, and we should get the car back Thursday. The cost, including parts, labor and the rental car should be around $600. So, since we did not have to return to Elizabethtown Wednesday I went outside and napped in the recliner for a couple of hours, and then did my workout sans the stair stepper part, then took a shower, and another nap. Around 3:30 we had dinner, and I took another nap......sounds like a theme is developing here....lol! Other than waiting to hear about the status of the car we didn't do much except rest. We headed over to Amazon like we were headed for the executioner. I'm not going to sugar coat it at all.....staying up all night is difficult, especially for a couple of old folks! The first half of the shift went very smoothly, and I was at 91% for the first 5 hours, but after "lunch" my concentration dropped off significantly, and I finished at 71%.....a little disappointing. The last half hour was brutal....I felt like I was having a bad dream. At this point I am writing it off to my body adjusting to the new schedule, and my brain not co-operating in the least. Our fellow Camper Force folk and having the same difficulty (the ones who have the grave yard shift like us). Our neighbors who are in their second year said it was to be expected, but that it does get better. We got home around 4:15am, but I was not ready for bed, and neither was TLE. We finally hit the sack around 5am, and I slept to around 10:30am. We'll see how Thursday goes. I wrote previously that I was 99% sure the culprit causing our Thunderbird Blues was the alternator. Then I got a call from Brandon at Bob Swope Ford saying they were leaning toward an electrical issue, because the alternator appeared to be working properly when they tested it. They spent Tuesday trouble shooting the electrical system, but came up with nothing, and driving the car around town they were not able to duplicate what happened to us. Around 12:30pm we drove back into Elizabethtown to return the temporary loaner and get a rental, but hoping that by the time we got there they would have the problem diagnosed, and fixed, but, alas, it was not to be. They were still troubleshooting the electrical system when we got there, so we called Enterprise and found they did have a rental available for us, so they came over and picked us up and took us back to their office to take care of the paperwork and give us our 2012 Ford Focus. We arrived back home around 3pm, and around 4pm I got a call from Brandon saying the mechanic had taken the car out driving again, and the problem resurfaced, and the car shut down. It had to be towed back to the dealership again. That's a good thing, because now they have ruled out the electrical issue, and have decided it is the alternator, or some module on it that is malfunctioning. So, they will pull the old one out Wednesday, replace it and then take it driving again to be sure. It should cost us around $475 including labor. We expect to hear sometime Wednesday, but I think we will wait to drive back into Elizabethtown again until Thursday. Meanwhile, "back at the ranch" we were girding ourselves up mentally to do our first 10 hour shift starting at 5:30pm. TLE made tacos for dinner (we ate around 4pm), which is always a bonus, and then at 5 we headed over to Amazon. The first half of the shift went well, and we ate "lunch' at 10:15 instead of going home like we did the last two weeks. Our next break was at 1:45am, and we were out the door by 4am. To me, and TLE confirmed this, it was easier than I thought it would be, but by the time 3:30am rolled around my eyes were starting to cross, and my mind was not nearly as sharp as it had been an hour earlier. It is clear that it will take a few shifts for our minds to adjust. On a side note I was at, or above 85% the entire evening, and for one 3 hour stretch I was at 122% of expectations. I was certainly on a roll for that stretch, and I thought my numbers would be good. I "picked" almost 400 items in that 3 hour stretch! Now the next adjustment is to get used to sleeping til Noon every 4 days a week....lol! Monday, our 3rd day of our 3 day weekend began innocently enough. There were high clouds, but it was almost balmy outside. 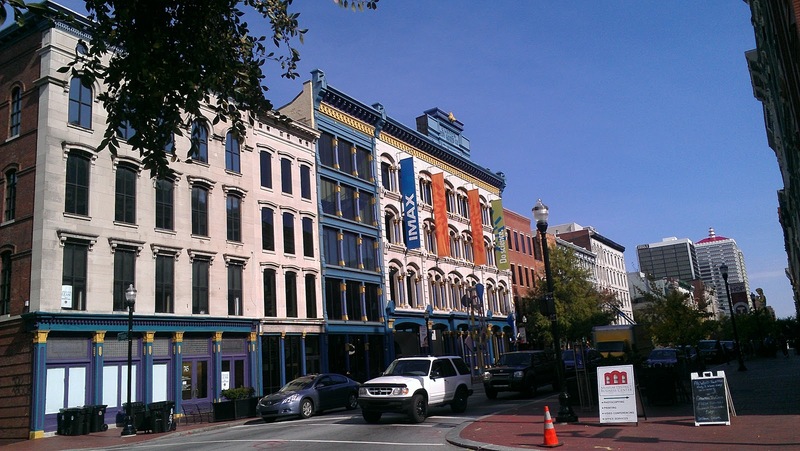 Our plan for this day was to drive into Louisville for the day to have lunch at a local brew pub, take in a few of the sites, and finish with a visit to Trader Joe's. Soon after I evacuated the "black" tank in our water bay (getting full after 10 days) we slid into the soft leather bucket seats of the T-Bird and headed northwest to Louisville which is about 85 miles away. The drive out Highway 210 to Highway 61 over to I-65 up to our destination was uneventful, but quite beautiful as the sun came peaking through the clouds lighting up the fall colors along our route. There is a lot of limestone in this part of the country and the juxtaposition of stark limestone walls with the fall colors was quite striking. 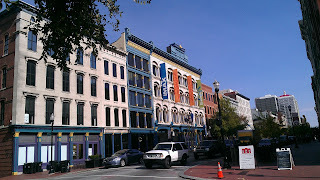 We arrived in Louisville around 12:15 and headed for the visitor's center on Main Street to get the lay of the land. As it turned out there was a highly recommended brew pub just a few blocks away, and also quite near some local attractions, so we found a parking garage around the corner and parked the 'Bird. We went directly to the Bluegrass Brewing Company located right next door to the parking garage and were shown upstairs to a table where we quickly scanned their craft beer offerings.....our eyes settled on Dark Star Porter, and we ordered two pints along with a Rueben Sandwich for TLE and Fish Tacos for me. The Porter was yummy, and the Fish Tacos with their special green salsa were delicious. We shared a pint of their Bourbon Stout, which has this interesting smokey Bourbon taste.....very smooth. YELP reviews gave this place 3.5 out of 5 stars, but we would give it a 4.5! Great, fresh, robust pub food with very good micro brews. 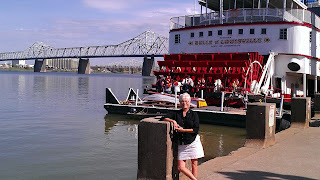 After lunch we walked down to the Ohio River and snapped this picture of the oldest operating paddle wheel boat on the Ohio River, Belle of Louisville, with the Clark Bridge in the back ground, named for William Clark of "Lewis and Clark" fame. 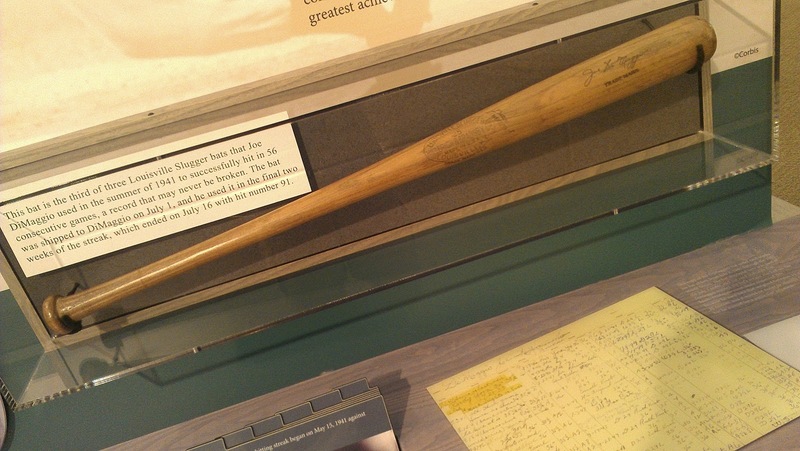 As we toured the museum prior to the factory tour I zoned in on two bats that were of interest to me.....one display of one of the three bats Joe DiMaggio used during his 56 game hitting streak, a record which still stands to this day. 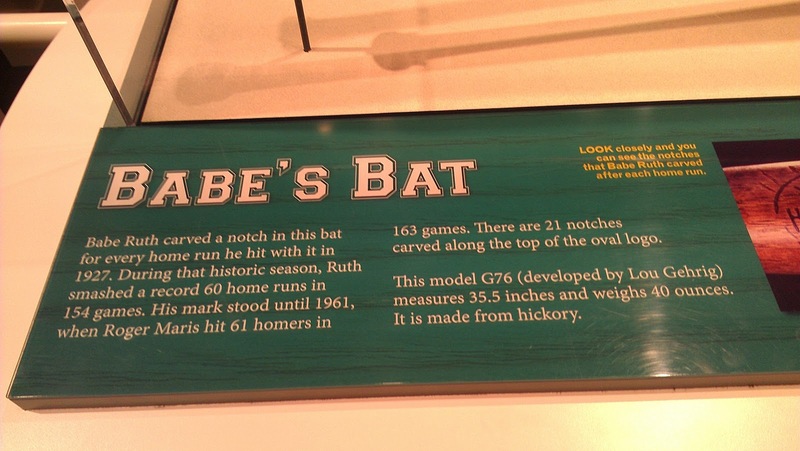 And, of course, one of the bats used by Babe Ruth in his then record setting year of 1927 when he hit 60 home runs in a 154 game schedule. Of course, we all know that record was broken in 1961 by Roger Maris when he hit 61 homers in 163 games. 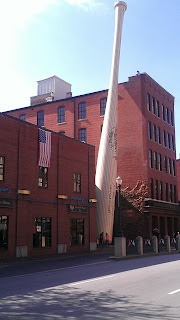 The museum and the 30 minute tour are fascinating, and I would recommend them to anyone. As we left the museum I took this picture of this old town area where most of buildings have been renovated, and re-purposed, or are in the process of renovation. It is a very nice part of town to take a leisurely stroll. We headed back to the parking garage to fetch the 'Bird and head over to Trader Joe's, and then back home. The drive back south on I-65 was pleasant, and very sunny as most of the clouds had now disappeared. Just as we were exiting the Interstate at Elizabethtown on to Highway 61 the radio suddenly went dead, the cruise control shut off, the A/C died, and the windows would not go up and down. The car still ran, but had no pep. I pulled over in a small business parking lot and turned the car off, then tried to restart it, but the battery was almost dead, and struggled to turn over the engine.....RATS!!! Based on the symptoms I believed the alternator had crapped out on us, and the engine had been running off the battery for a few miles. So, we called AAA who sent a flatbed tow truck over right away. While we were waiting we called Hertz and Enterprise to try and rent a car to drive the last 40 miles home, but at almost 5pm they were both out of cars! Hmmmmm?!! Eddie, the tow truck operator was very efficient and quickly delivered us to Bob Swope Ford a few miles away. He had a "Jumper Box" that we hooked to the battery in the trunk, and the car started right up, the radio came on, etc. I then moved the 'Bird into position to be pulled on to the flat bed. That the car started right up with enough juice, and ran normally leads me to believe my diagnosis of a bad alternator is correct. At Swope Ford we met Justin, a 20 something service writer, who also tried calling Hertz and Enterprise hoping his sway would get us a vehicle maybe being held in reserve, but he struck out. The service department by this time was closing as it was close to 6pm, and their only loaner was being used by another customer. Initially Justin was offering to drive us back to Campbellsville, but then Steve Warren, the used car manager, came over and offered to let us use one of the used cars on the lot as long as we would bring it back the next day. Whew!! We, of course agreed, signed a temporary "rental" agreement (there is no charge), and headed home to await the news of what is wrong with our Thunderbird and how much it will set us back to ransom it from the service department on Tuesday. We are praying it is something simple like the alternator, which I am 99% sure it is. So we sit around 10am on Tuesday awaiting news of our car. We'll have to leave within a couple of hours to make the round trip to Elizabethtown, and Swope Ford, to retrieve our car, and get back in time to start our 5:30pm shift at Amazon. In Bizzaro World (Superman reference alert) Sunday would be called Saturday......Saturday was cloudy, COOOLD, and windy whereas Sunday was sunny, warm, and windless. On Saturday the heaters were on all day long, but on Sunday they were off by 10am. Our "written in Jello" plan for Sunday was Brunch at Campbellsville U. at 11:30am, then off to Green River Cinemas to watch "Taken 2", followed by a brief shopping excursion to Walmart, and ending with a couple of NFL games. Amazingly that is exactly how the day went. We, again, slept into 9am....of course it would help if we didn't stay up to 1am every night; although I'm thinking we are subconsciously preparing for our 10 our shifts to 4am each morning. Staying up to 1am seems easy now, so what's three more hours between friends.....hmmm? We left Heartland around 11:15 for the University dinning hall, and met our new Camperforce Friends Jim and Jackie, and Bob and Doris. This time the guys sat together, and, of course, the conversation was mostly about Jim and Bob's flying days in the Airforce. Jim flew refueling tankers (C130's?) during the Vietnam War, and afterwards. Listening to Bob talk about some of his youthful exploits flying Tomcats made me feel like I was listening to the audio from "Top Gun", and Jim had several interesting stories about refueling assignments that almost went sideways. One of the more interesting stories was when a fighter over Haiphong Harbor had been hit and was losing fuel fast. Jim's crew "hooked" up with the pilot's jet providing a flow of fuel all the way back to the aircraft carrier so he could land the crippled jet without crashing. We headed directly from Brunch over to Green River Cinemas to see Taken 2. This sequel to "Taken" starring Liam Neeson was around 105 minutes long, and like the last few action movies we have seen grabbed you by the throat and didn't let go until the credits began scrolling up the screen. I don't know if I could have taken much more intensity. We both liked it. We exited the theater by 3:30 and rolled across the street to Walmart to pickup some artificial logs for a fire, some more Rain-X (it seems I left my other bottle in Spokane), and a few other items, then home to continue in our relaxation mode. Just after the end of the 4pm game between the Patriots and Jets (Patriots won in overtime) we lit the fire and settled in for a couple of hours of mellowing out even more. While we wer enjoying the evening and the fire Fred and Gladdy walked by and struck up a conversation about their workcamping adventures for about an hour. They just started their training week this past Tuesday. We got a couple of great ideas from them about future work opportunities, one being the beet harvest in Montana the first part of October each year. In 2.5 weeks they made over $7,000. Gladdy directed traffic and Fred operated a large machine that processed the beets that were brought in by large trucks. Around 11 we watched "The Amazing Race".....yep we are still on West Coast feed so primetime starts at 11pm for us, but that's cool, because we stay up late anyway. Keep moving....ignore the guy watching football! Saturday was a complete veg day for at least one of us. We both slept in until 9am (one of us slightly later.....) and didn't get around to eating breakfast until it was called brunch. By the time we finished TLE's nicely prepared fried eggs, sourdough toast and maple sausage it was time for the first NCAA football game. I pretty much sat in the new recliner with my feet on the ottoman watching college football the rest of the day. I did get up occasionally....once I remember walking over to the office to get our mail, and another time I helped fold the clothes that TLE had washed, and maybe a few times to visit the little boys room, but other than that I pretty much sat in the chair all day watching football, and catching cat naps. One good thing about the mail delivery yesterday was that we got our absentee ballots for the upcoming Presidential election, plus a myriad of State and local propositions in California. We both sat down and went through the voter's guide, made our choices choices and then transferred them to the mail in ballot. I am grateful TLE shares my political philosophy and votes the way I do. It would be difficult to know that we were just cancelling each other out each election. TLE spent part of the morning before mail call defrosting the freezer, and what a job that was. The last time it was done was way back in Spokane in June when we were at my sister's home for 5 weeks. The freezer space had shrunk considerably, and I have noticed when it gets iced over the fridge does not cool as efficiently. I think it took her the better part of an hour to defrost it. The weather we had Friday continued into Saturday. I think the high was 55 for the day, and it was blustery and cold. Nice to be sitting inside with the heater going on a day like that. TLE reheated some of the stew we had last week and it had aged nicely. Again, hot stew was the perfect choice for a cold, blustery day. Sunday we will head over to Campbellsville University for their Sunday Brunch again and spend time with our Camper Force friends, and then head over to the Greeen River Cinemas for an afternoon movie.....maybe "Taken 2". Then, of course, there will be NFL Football in the afternoon and evening. Sounds like another relaxing day is in store. On Monday we are thinking of driving into Louisville for the day. TLE says there is a Trader Joes there, and a Whole Foods, etc., so it sounds like a fun day will be had by all. Friday marked the end of our "honeymoon" phase at Amazon.com. Next Tuesday we begin the "Full Monty" shift.....10 HOURS each day Tuesday through Friday. I have been trying to visualize myself doing my picking job for 10 hours, because 5 seems long already.....lol. I guess the only way you find out if you can do it, is to actually DO IT! So, Tuesday we will make another adjustment to 10 hour work days. We will now have to take a "lunch" with us each evening for our 10:15pm lunch break. One thing we needed to get resolved Friday night was our locker assignment. We should have had it a week ago, but somehow our "paperwork" got lost in the shuffle. The lockers in break room "A" are stacked 4, or 5 high. We were joking with our friends Rick and Patricia, who are short people, that they would get one of the high ones, and that we would get one of the ones lower to the floor. So far half that prophecy has come true as they got a high one. Friday came in with a "BRRRR!!! ".....temps never got out of the 50's, and it was breezy and heavily overcast all day. I did tackle waxing the rest of the rear cap, and managed to get the other three quarters done even thought the low temps caused the wax to dry slowly. It looks good, and I'll tackle the front cap on Sunday when it is warmer. Then I'll just have both sides left to do. I remember fondly the time just 9 months ago when Carmello and Tom Montoya of Integrity Mobile Detail washed and waxed our coach in just a few hours......do I ever miss them! It is a lot of work! I felt tired on Friday after 3 days of work, and 4 workouts (Monday through Thursday) under my belt. I waffled back and forth about doing my workout on Friday. Ultimately I did my workout, but later that evening I would regret doing 5 in a row as I was just "off my feed" most the 5 hour shift. I think I'll back it off to 4 in a row each week until I get my conditioning back to where it should be. My main reason for being here it to work for 10 weeks (now only 8 are left) and I need to be sure nothing interferes with my ability to do my job. The other thing I am thinking is that since I will be walking 10 miles per night I may eliminate the stair stepper routine and just do the stretching, pushups, curls, ab roller, deep knee bends, etc., but we'll see how I feel. The Friday night shift went well, other than my feeling a little punk. The first half I was at 89% of my picking goal, and in the low 80's for the second half. I'm getting where I need to be (85%), but just need to work at consistency. Doing 4 tens will test my consistency for sure. TLE and I both hit the "green mile" (the designated walking path marked with green lines through all three buildings) at the same time, which is the first time that has happened, and headed for home. Looking forward to 3 days off....really will feel more like 4 since we don't go back to work until Tuesday at 5:30pm! As we exited through Security one of the guards came over with our locker assignment, and combination for our lock. Sure enough, just as I prophecied, our locker is second from the floor, so we have to "stand on our heads" to open our locker.....that is so funny! They should ask you how tall you are on the locker application....wouldn't that make sense.....hmmmm? A few weeks ago while in a Super Walmart I bought some Turtlewax. The can has been sitting in my storage cabinet staring back at me every time I opened the door. Since Thursday was such a nice sunny day I decided it was time to start tackling a small section of the Newell at a time to get a good coat of wax on her for the winter. I started on the top of the back cap and managed to get 1/4 of the back cap done. I'll work on the second quarter Friday, and then knock the rest of the back cap Saturday. Then I'll only have the drivers side, passenger side and front cap to go.....that is a lot of square footage. I should be an award winning Karate Kid by then, huh? Apparently the wind was so strong Wednesday night that it blew out the water heater pilot light, but we didn't discover that until late afternoon when TLE was washing dishes. I am always impressed with how long the water stays hot after I have turned off the pilot light for travel days. After the wax on, wax off work I took care of a little "office work" and TLE went into town to do a little shopping. By the time she returned it was near 2pm and time for me to do my "workout". This was the fourth consecutive day I have done the workout, and the 6th in 8 days. I'm down about 2.5 lbs since last Wednesday. After Friday's workout I'll take 2 days off to give my muscles time to recoup, and then hit it hard again Monday. Next Tuesday is the beginning of our four 10 hour days. Up until Thursday we had been picking in Building A exclusively. There are three buildings in all (A, B & C). Both TLE and I had gotten comfortable with finding our way around the 3 pick areas in Building A (P1A, P1B, and P5A), but on Thursday our supervisor "unlocked" us in the computer so "it" could send us wherever it wished. Now the temperatures in Building A have been warm, and short pants and t-shirts were the order of the day, but suddenly my handheld scanner directed me to Pick area P4J (Pick area J, 4th level) in building B late in the first half of my 5 hour shift. I would say the temperature in Building B is at least 10-15 degrees cooler in places, if not more, and I spent most of the 2nd half of my shift wishing I had a long sleeve shirt on, especially when I was directly below some of the large air blowers pushing a high volume of cold air directly down on the area I was picking in. Now that we are moving around it will be a little more difficult to decide what to wear as our work area assignments will be totally random now that we are "unlocked". I was so glad I had brought my jacket to work for the walk home. I even got a cup of hot coffee while I was waiting for TLE to make her way back to the break room at the end of our shift. Well, tomorrow is Friday, and the end of our 4 days on, and next week the real test begins as we will be in the Amazon building 10 hours a day four days a week, then eventually 5 days a week as the Xmas season begins to ramp up. For 4 days a week we will be essentially sleeping, eating and working. Eight weeks to go in the 10 week marathon! Wednesday was finally the day for our bike ride. I know I've been leading you on in this regard about plans to take a tandem ride over to Green River Lake. Names like this always puzzle me. I have a friend back in Ontario, CA that lives on a street called Desert Forest....what? Is it a forest or a desert? Is it a river, or a lake? Anyway, I digress. Green River Lake is a reservoir built by the Army Corp of Engineers in 1969 and covers a little over 8200 acres, and is filled by, you guessed it, the Green River! After writing my blog post for Tuesday I got busy preparing the tandem for our ride. I think the last time we rode it was in Vancouver when we did the long ride over to Ft. Vancouver and back. That was the day we blew out another rear spoke, which I replaced while we were in Twin Falls, but we never got out on it, or any of the bikes while we were there. That was when we got into walking every day in preparation for our Amazon gig. So, this was the first time on it since August. The riding distance to the lake is around 7.5 miles, and the highway for about half the way has a very wide shoulder, which was unexpected, but we were bucking a stiff headwind for the first 3.5 miles. Nevertheless, the air was balmy, and the views were great. It took us about 45 minutes to cover the 7.5 miles over to the lake, and we were treated to a lot of color in the autumn foliage. We just sat at a picnic table for about 30 minutes talking and enjoying the view, then remounted the tandem and rode through the campground. 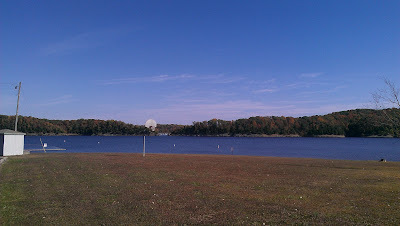 Surprisingly there are not many Amazon campers at the lake, and not many people in general. I suspect that many Amazon people have opted for parks a little closer to the facility as the other RV parks we passed on our ride were completely full. After touring the RV park we headed back to Heartland. The ride back saw us being pushed along by a strong tailwind. On the way out we were running around 11 mph, but on the way back we were pushing over 20 mph at times! 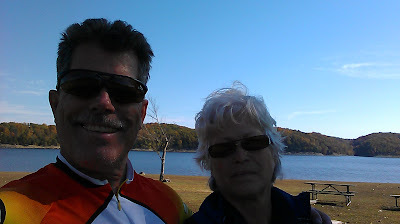 It was great to get out and ride, and we will try to do the ride to the lake a couple of times a week. Additionally, we discovered there are a lot of mountain bike trails running through the park, so I will take my mountain bike over this Saturday morning and do some exploring on my own. We arrived back "home" around 1pm. TLE made a PB&J on rasin/cinnamon bread........mmmm good! After a 30 minute nap I headed out to the "garage" around 2:15 for my daily workout sans the stair stepper routine since I had just ridden 15 miles earlier. For dinner before work TLE prepared the most amazing stir fry....I cherished every single bite, and was it ever spicey! It wasn't long after that 5pm came and we headed off for our 5 hour shift. The night started with a 30 minute staff meeting. Apparently sometime in mid November we will be given mandatory overtime adding a 5th 10 hour day t our schedule, and then sometime in early December we will be offered a 6th voluntary overtime shift. We're not sure if we are down for working 6 out of 7 days, but we'll see how we feel at that time. Our night of "picking" went fast, and we made our way home for the evening. Only two more days of half shifts then we are into some serious all night work from 5:30pm to 4am 4 days a week, then into five 10 hour shifts sometime after November 10th. Can't believe we're about to finish our second week at Amazon.....only 8 to go! I was up Tuesday morning before TLE....nothing new there (lol) around 8am....it does not get light until then, which means I can actually sleep in a little. I had a little insurance work to get out of the way so I jumped on that and then worked on yesterday's blog post (Monday, Monday). By that time The Lovely Elaine was up and the day was officially begun! Since we arrived in Campbellsvile I have been developing a "To Do" list of things that need fixing, replacing, adjsuting, etc. As of yesterday morning it had reached 9 items, so I decided it was time to knock a few off the list. The first, which has been bugging me for some time, was to remove the exhaust fan in the shower. It has developed a loud vibration over the last few months that would come and go, but now it has mostly come and not leaving, so it was time to deal with it. I removed the vent cover inside the shower and discovered that I would have to go on the roof to remove the cowling in order to loosen the two bolts holding it in place. So a one person, small remove and clean job now required 2 people....TLE in the shower to catch the fan assembly after I (on the roof) loosened the two bolts. Once that was accomplished I took the fan into the "garage" to remove the fan blade from the 12 volt electric motor. Everything seemed to be fine, except both the motor and fan blade had 30 years of dirt and grime build up. I cleaned the fan blade thoroughly, and did the same with the motor. I also put a little penetrating oil on the shaft where it enters the motor and then ran it using my 12 volt bench tester to power it....as the oil was pulled down the shaft it began to run more smoothly. I then reassembled everything and reinstalled the fan in the bracket that holds it. It now runs smooth and quiet! The second item was a much less complicated one.....I noticed a week, or so ago that one of the license place lights was out. When I looked at the wire supplying the 12 volt power I saw that it was hanging loose, and not connected to any power source, so it was just a matter of reconnecting it, which took just a few minutes. OK, 2 down and 7 to go! I then spent time cleaning up our road bikes, and replacing the tube in my front tire, which had developed a fast leak. The old tube was fixable so I put a patch on it and kept it for future use. By the time I finished cleaning up both bikes it was time for lunch, and then a short nap. We were going to take a ride over to the lake, but TLE's foot had been bothering her from all the walking we have been doing on our temporary job, and she did not want to do anything that might cause it to get "tingly" again. On our walk home from work last night she said here foot was doing fine, so maybe we can get that ride in Wednesday! I got another workout in yesterday afternoon....that's 4 in the last 6 days. Hoping to do one a day Monday through Friday this week. That combined with walking 5 miles a night on my job should start to shed some pounds. I can tell my metabolism has increased, and I am sleeping better already. It is amazing to me how just a little exercise done consistently produces such quick, noticeable results. Next week we start our 10 hour shifts, and our nightly mileage will increase to 9-10 miles. Some of our new Camper Force friends wear pedometers while they work, and are reporting 10 miles each night pretty consistently. Our 5 hour shift went smoothly, although I spent most of the 5 hour shift on the fourth level picking books, DVD's, and CD's and it is very warm up that close to the ceiling. I had to take a second shower when I got home. We watched recorded episodes of Revolution and Castle to wind down, and hit the hay around 12:30am. "Monday Monday, sometimes it just turns out that way"
Couldn't help but quote lyrics from one of my favorite Mamas and Papas songs from 1966. I always tell people that the summer of 1966 was the best summer of my life (caveat for TLE....other than the summer of 1971, when we got married...:D). I spent the entire summer at a church summer camp in Orr, Minnesota....about 50 miles from the Canadian border. By entire summer I mean I got on the bus for camp the day after school was out my Junior year of high school, and returned two days before school was back in session. That summer I worked in the camp dining hall as a "bus boy" clearing off the tables after the campers finished eating. I had 3 shifts per day (6-9am-breakfast; 12-3pm-lunch; 6-9pm-dinner). After breakfast I spent 3 hours working on my tan at the swimming docks. After lunch I spent 3 hours water skiing, and after dinner I went fishing for Northern Pike....a very good eating fresh water fish. The sun did not set until after 11pm, and we were treated often to the aurora borealis (northern lights). I returned home with the best sun tan of my life, and hundreds of great memories and stories that I still share to this day. We had planned to go for a bike ride, but TLE was deep into reading a 4 book series by the aforementioned Nora Roberts, so I spent the day piddling around in the "garage" inflating bike tires, vacuuming out dirt that had ingressed into my "man cave", and then vacuuming out the T-Bird. I also redeployed the awning, rehung the awning lights, and redeployed the lounge chairs. For the finale I drove over to the Campbellsville Post Office to mail our Fed and State taxes. TLE made a wonderful, delicious meatloaf for dinner with sides of carrot/cabbage salad and mashed potatoes.....yum....and I managed to be satisfied with one helping of each. After dinner we watched a recorded episode of "The Mentalist", and then it was time for Monday Night Football. I was expecting a good game, but the Broncos special teams started out with several mistakes, and were down to the Chargers 24-0 by the end of the first half, so I changed the channel. There was nothing I saw in the first 2 quarters that led me to believe the Broncos had anything resembling a chance at winning that game.....NOTHING. I turned back to the game near the end of the 4th quarter just to see how bad it was, and found that the Broncos were ahead 28-24.....wth? I missed most of the greatest 2nd half comeback in NFL history....the Broncos scored 35 unanswered points in the 2nd half, and Phillip Rivers threw 4 interceptions....wow! Today we'll get on the bikes and do a little local site seeing. Thanks for stopping by! At 7:30am the sky was steely gray, and the wind was gusting at 20mph. I checked the weather report and it foretold 50% chance of rain sometime Sunday. After a couple of hours we decided to lower the patio awning, and I am glad we did as it stayed windy all day long and into the evening. Our neighbors to our immediate right, Jim and Jackie, invited us on Thursday to join them and some other Campers for Brunch at the Campbellsville University Dining Hall. I wrote previously about the great price of $7 per person for their Brunch. Well, that is the price for any of their meals, and if you buy a booklet of ten meals the price goes down to $5.75 per meal. Jim is retired Airforce, and Jackie is a retired Dean of Students at a Tennessee college (I did not catch the name), and she also has a PhD. We are finding that this Nomadic crowd of full time RVers is a very diverse group of people from all walks of life. We met them around 11:15am, and also got to meet Bobby and Doris, their friends. Bobby is also retired Airforce. There were a number of other Campers who joined us...Deborah and Marti, Mary Lloyd, and several others whose names escape me now. Frankly, I'm amazed I remembered that many names. It seems to take me at least two times, if not three, after meeting someone new for their name to penetrate my thick skull. The food was just as good as the company, and we will probably buy a book of tickets and eat a few more meals there. If nothing else, it is a nice gathering place for us Camper Force folk to get to know each other outside of our jobs. After a very pleasant Brunch TLE and I headed out to the liquor store just over the county line to restock for the next two weeks. After that TLE drove me home, and dropped me off while she went to do grocery shopping so I could FINISH the taxes, FINALLY! When she arrived home a couple of hours later I was nearing the finish line, and with her help I scanned a few documents, and printed out a bunch of 1099's, and other documentation to attach to our return. This year we actually get money back from the Fed's, and the People's Republic of California. As if to signify a watershed moment the skies finally opened up and the 50% chance of rain became 100%. The rain continued on and off, sometimes quite heavily, until we went to bed around midnight. In the interim I settled in to watch NFL football....I enjoyed seeing the Seahawks edge by New England by 1 point, and the Giants wiping the floor with the 49ers. The Cowboys did what they do so well.....lost a game on the last play of the game. And for the finale the Packers annihilated the Texas in the evening game.....nice to see the Packers of old show up again. Tomorrow is supposed to be a sunny day, and if that comes true we will most likely take a bike ride out to Green River Lake, a Corp of Engineers designed and built reservoir which is also a State Park with a nice RV Park. Buying that new Euro style recliner was brilliant. It has now become my favorite nap spot. I think I took no less than 5 naps Saturday while watching NCAA football in between. It is sooo comfortable. We really did't do anything on our first day off after 4 days of work except deploy the EZ-UP cover over the T-Bird. Other than that very brief project, and some more tax work I did to finalize my 2011 taxes, I watched football all day, and into the late evning, and TLE read, and read, and read.....of course she has a lot of books, and she has been adding to her stash since we arrived here in Campbellsville. Is there a 12 step program for Nora Roberts addicts? That woman is a prolific writer. She apparently turns out novels faster than I can do my daily blog.....lol! We got a new neighbor on our driver's side, and several other previously empty sites here at Heartland have begun to fill up with new members of the Amazon Camper Force. Over the next few weeks the park will reach capacity. Most of Saturday was partly cloudy, and coolish, but it began to warm up toward the evening, and we left most of the windows open when we went to sleep. The weather reports says it will rain on Sunday, so we'll see. Not much to report for Saturday. We'll head over to Campbellsville University tomorrow for Brunch. Apparently they have a great buffet, and it only costs $7 per person. I'll let you know how that goes tomorrow! At first I thought it was a bird walking around on the roof at 4:30 in the morning, but within seconds I realized it was starting to rain, and within minutes it was raining hard. That was a nice way to welcome in Friday. I don't know when, but the next thing I knew it was after 7, and the rain had stopped, and the sun was blazing in the rear window of the coach. It's always nice when it rains while you are sleeping, and stops when you get up.....perfect! Since we started working our half shifts, which end at 10:30pm, we have been staying up after midnight. As a result TLE has been sleeping in to around 9am, or later. I usually take at least an hour nap in the afternoon before we go to work, so getting up at 7, or 7:30 works for me. I spent part of the morning doing "office" work, and then we headed into town to look for a new Euro style chair to take the place of the green folding chair I have been using for a year. When we were hauling around our trikes, and TLE's sat in the space where my chair, and the fold down table was it made sense, and was more practical. We decided now was the time to get something that fit the space, and the style of our coach more. We looked at a couple of furniture places, but they had no Euro style chairs. So we went back to Big Lots again, and found exactly what we wanted for $199! I watched TV last night sitting in this wonderful chair/recliner. Putting my tired feet up on the Ottoman was perfect! I think we scored a touchdown with this chair, for sure! However, I, once again, get a little ahead of myself. The chair came unassembled in a box that fit in our small trunk with a bungee to hold the trunk lid from flopping around while we drove the 1.5 miles home. We quickly emptied the box of its contents and began the relatively easy assembly of the Euro chair. By 2pm we were walking down to the roll away trash bin with the empty box, and packing materials, and the chair was assembled. Around 3 I took an hour nap, and when I awoke TLE had two fajitas ready for dinner.....and they were very, very good. We walked down to Amazon around 5pm, met up with two of our Camper Force friends and walked to the "stretching" area. One thing I have not mentioned is at the beginning of each shift everyone gathers at a central area to go through the recommended stretching exercises, and while we do that we are given instructions for the day. Before we stretch we each pick up our scanners, install a charged battery, pick up some water bottles from the dispensing machine. By the way, water and coffee are provided free to all employees, and the coffee is not half bad. Essentially our half shift consists of "picking" from 5:30 to 8pm when we take our 15 minute break, then we pick again from 8:15 to 10:25. We can "clock out" from 10:28 to 10:37. This half shift went the fastest of our shifts this week, and before we knew it TLE and I were walking home cooling off in the cool night air. We we start our full shifts we will take "lunch" at 10:15 to 10:45, then another 15 minute break around 1:15am, and then finish our shift at 4am. I spent a couple of hours watching the end of the Nationals v. Cardinals playoff game in which the Cardinals overcame a 6 run deficit to win the game and advance to play the Giants for the right to go to the World Series. Then we watched NCIS and NCIS L.A. without commercials and got to bed by 1am.....of course we are starting our 3 day weekend, and don't go back to work until 5:30pm on Tuesday! Almost like 4 days off! Based on the amount of information I have been attempting to absorb it feels like day 10....lol! We were greeted with a mostly clear sky and bright sun, but it was very, very cold.....it got under 30 degrees Wednesday night. The heaters worked overtime most of the morning keeping our tootsies warm. For the time being I go through the preceding sequence 3 times. Hopefully in a week, or so I can increase the numbers. Then I get on the mini-stair stepper I bought in Twin Falls, ID for $1.99, and do that for 30 minutes. So, in all, the workout takes about 45 minutes. Eventually I'll add in 10 minutes of jogging around the park. Now that we are stationary it will be easier to develop a routine, and, hopefully, stick to it more faithfully. A few weeks ago the battery on my Dell Inspiron 6000 laptop gave up the ghost, so I ordered a replacement on Ebay for $24 shipped, and it arrived yesterday. Now I can unplug my laptop and the battery power will last more than 5 minutes! Around 4pm we had a small dinner....nothing much worse than starting a shift with a too full stomach. Our team leader, Paul, spent the first hour of our shift going over our process training again, and even though I complain mildly about all the information, and the repetition, it is good. Even after that I spent 5 minutes trying to scan a "bin" bar code before I had scanned the "tote" bar code. A "bin" is where the item we are picking is located, and a "tote" is where we place the item we have picked. You must scan the "tote" first. There is a sequence you must follow, and if you do anything out of order your scanner sounds an alarm that I am sure can be heard in the next county......sounds almost like a siren on an EMT vehicle....:D Finally, I figured out what I was doing wrong, and the night went pretty smoothly. I mentioned yesterday that Amazon expects you to get to at least 85% of your daily goal...after just a few hours now I'm at 79% after the first half of Thursday's shift. TLE, on the other hand was at 99%.....I had to pry out of her what her percentage was, because she didn't want me to feel bad. I don't know why I should feel bad.....she's been operating this kind of scanner for years in a retail grocery store environment. The nice thing so far is that the time does seem to fly by, and I am getting more comfortable with my environment, and finding my way around the 1 million square foot building. In a week, or two I'll have to post about some of the unusual things we pick. This is exactly what our scanner look like except the screen is black and white, not color. For me it was a little warmer than the night before. I basically wear a t-shirt and shorts with New Balance (NB) running shoes, and I still get too warm.....it's probably because I started working out and have increased my metabolism. Some of our co-workers who are here for the 2nd, or 3rd year say we will experience some weight loss......oh, I hope so! We arrived back "home" around 10:40pm, and unwound for an hour, so so watching a pre-recorded episode of this season's Survivor. Our work day Wednesday started at 5:30pm. Wednesday is the day we would receive our "Process Training".....in essence, we were trained to "Pick" the Amazon way. They use handheld scanners which is the linchpin of their inventory control system, much like it is for a grocery store, or any retail store nowadays. The training took about 2.5 hours....you are taught how to locate "pick" items, and how to process them, as well as what to do when an item is not where it is supposed to be (missing), can't be scanned, or is damaged. Then we were taken to a practice area where we had to locate and "pick" 28 fake items, which included dealing with missing items, and damaged items. Fortunately, missing and damaged items are rare, but you are taught to be thorough in trying to locate the missing item, and to be observant as to damage. We then took our 15 minute break, and then began the real work. We were taken to the area where we would do real "picking" for the remaining 2.5 hours of our shift....normally, once we start our 4 ten hour days, we would take a break 2.50 hours into our shift, lunch at 4.25 hours into our shift, and would have had one more break 2.5 hours after our lunch, but on this night we were only working the first of our "half" shifts, so we worked right through to 10:30pm. I was pleasantly surprised at how fast the time went....before I knew it my scanner beeped, telling me to take my lunch (which we weren't taking this night as it was only a half shift), so I knew I only had 15 minutes left. Normally our lunch would run from 10:15pm to 10:45pm. My goal, according to the scanner screen, was to pick 170 items .....I got to 166 when my shift ended. No too bad for my first night. I spent 99% of my time on level four of the "pick mod" picking books, CD's, and DVD's that had been ordered by customers. Level four is the 4th floor of that "pick mod". TLE and I are both glad we have jobs that require is to pretty much be in motion the entire time. I think it's easier on my feet and legs than just standing in one place for 5, or 10 hours. The walk home took about 5 minutes.....it was a little warm working four floors up, so the cool 45 degree air helped cool both of us down as we walked home. By the time I wound down it was after midnight. The temperature got under 30 degrees last night, so I am glad I took time to "wrap" my water hose.....nothing froze last night! Thursday we will start our shift right back at "picking", but this time for the entire half shift.